BBQ crabs were invented at Granger's in Sabine Pass, TX, during the late 1940's when one of their cooks seasoned a blue crab with some zestful seasoning and then deep fried it. The rest is history! Granger's, a once-popular Sabine Pass roadhouse, was destroyed by fire in 1958. Many years later, Sartin's Seafood in Sabine Pass resurrected the tradition. Unlike "Maryland Style" crabs where live blue crabs are first seasoned, steamed whole, then cleaned on-the-fly by the hungry diner, BBQ crabs are cleaned first, seasoned, and then deep fried. When the waitress delivers the steaming tangle of barbecue crabs and sets the heaping platter before you, there's no doubt where you are: Sartin's Seafood. The crabs are fat and full of sweet, rich meat and crusted with a red-pepper spice mix that sets a tenderfoot mouth afire. 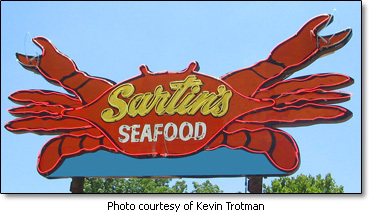 Sartin's Seafood started in 1971 when Charles and Jerri Sartin opened a little restaurant (four tables inside; four tables outside) in front of the family's 65-foot trailer house in Sabine Pass, TX, and started serving seafood. It has been locally famous ever since! Sartin's BBQ crab recipe calls for fresh hard-shell blue crabs to be cleaned and broken in half, dusted with their "secret" seasoning mix and then deep-fried. Sartin's original recipe called for Sexton's Alamo Zestful Seasoning, but Sexton went out of business and they had to come up with a similar seasoning to use. In 1978 the Sartins' worked with Bolner's Fiesta Products to try and duplicate the Sexton formula. It took 28 tries to get it just right. They now buy 40-pound buckets of what's called Sartin's Seafood Famous BBQ Crab Seasoning. Sartin's now has three locations, all of them family-owned. One in Nederland, one in Beaumont, and one in Houston. Kelli Sartin, the daughter of the founders, opened the Houston restaurant after her shop in Beaumont was destroyed by Hurricane Rita in 2005. The owners of the other two restaurants are Kim Lynch and Emily Summers. The original Sartin's in Sabine Pass closed in 1988. Start with live hard-shell blue crabs, discarding any that are dead. 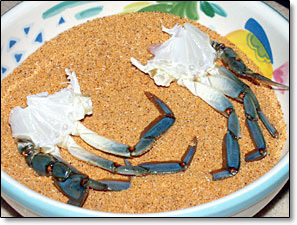 Place the live blue crabs in ice-water for several minutes to stun (it is best to use a large cooler for this purpose). Once immersed in ice-water, the crabs will become dormant. After several minutes the crabs will be "asleep", then you can easily handle them with your bare hands. Take each crab and remove it's carapace (top shell). This is done by grasping the legs on one side of its body and prying the shell off, using the sharp spines for leverage. This kills the crab instantly. Turn the crab upside down and, using a knife or other sharp object, pry up and remove the crab's "apron" which is folded up under its body. Turn the crab right-side up. 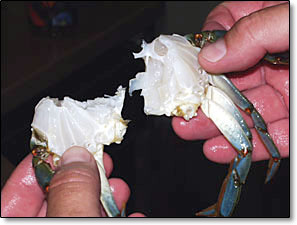 Using your thumb and index finger, grasp the crab's mouth parts and twist off to remove. Remove the spongy gills from each side of the body and the entrails (guts) from inside the main body cavity. Rinse clean. Repeat this procedure until all of your crabs have been cleaned. After all of your crabs have been cleaned, remove the two large claws and reserve. Do not remove the legs. At this point you should have two halves, each with four legs still attached. Each body half should be completely clean and consist of nothing but glistening white shell with meat inside. Dredge each body half in seafood seasoning (see resources below) to completely coat. Place the seasoned crabs in the refrigerator for 1 or 2 hours to allow the seasoning to penetrate into the meat. "Pappy" Painton used to live in Port Arthur, TX, back in the 1960s and raved about the BBQ crabs at a place called Mama's that was located under the big bridge in Port Arthur. Evidently he managed to get the secret recipe from the cook after a night of crabs and beer. The secret recipe was basically Liquid Smoke and Sexton Alamo Zestful Seasoning. Mix one part Liquid Smoke with one part water. Place cleaned crabs in the Liquid Smoke mixture for several minutes prior to coating with seasoning. 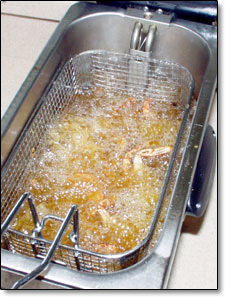 Heat oil in a deep-fat fryer to 350°F. Remove the crabs from the refrigerator. Once the oil has reached the proper temperature, drop a few of the crabs into the hot oil. Deep fry until they turn red and float to the surface, approximately 5-7 minutes. Repeat until all of the crabs are cooked. Serve immediately, while steaming hot. Optionally, you can sprinkle the cooked crabs with more seafood seasoning before serving. The claws, which were removed, should be boiled in water until they turn bright red and float to the surface. Boil the crabs for three minutes prior to seasoning and frying. This technique helps prevent the meat from sticking to the shell. With a crab in your hand, grab one of the legs and gently twist and pull it off. With any luck, a large lump of delicious white meat pull out with it. Repeat with each leg. Once all the legs are pulled, cut in half and use a knife to dig out the remaining meat. The boiled claws should be cracked open to reveal the delicious, sweet claw meat inside. 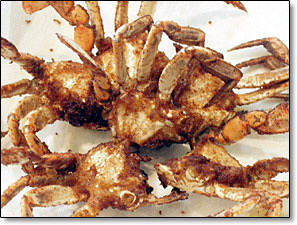 BBQ crabs are prepared using a spicy seafood seasoning. Originally, Sexton brand Alamo Zestful Seasoning was used exclusively (a former Sexton employee once said that Sartin's Seafood was by far the largest buyer of Alamo Zestful Seasoning.) But, in 1983, John Sexton & Co. was sold to S.E. Rykoff & Company and Sexton branded products vanished from the market. People scrambled for a replacement. Reputations were on the line, so restaurants consulted chemists in an effort to exactly duplicate the taste of their beloved crab seasoning. Bolner's Fiesta Products is a spice manufacturer who claims to have closely matched the unique flavor and cooking characteristics of Sexton's original blend. Sartin's Seafood, the restaurant that made BBQ crabs famous, worked with several different engineers to exactly duplicate Alamo seasoning in order to keep their trademark BBQ crabs on the menu and their customers happy. After a lot of research, I have been able to locate several other spice manufacturers who market Alamo Zestful seasonings of their own. The fruits of my labor follow. Sexton Alamo Zestful Seasoning - This is purportedly the original "secret" BBQ crab seasoning that started it all... and was the seasoning originally used at Granger's and Sartin's a long time ago. Alamo Zestful Seasoning was manufactured by John Sexton & Co., founded in 1883. Beatrice Foods purchased the John Sexton Company back in 1968 and continued to market the Sexton brand. But, in 1983, Beatrice sold its Sexton Foods operation to S.E. Rykoff & Company which then dropped the Sexton label. Monarch Alamo Zestful Seasoning - Monarch is a subsidiary of U.S. Foodservice (U.S. Foodservice purchased Rykoff-Sexton in 1998.) It is not known whether U.S. Foodservice re-branded the original Sexton product under its Monarch label or if this is a new formulation, but I suspect that it is the same formula. Monarch brand seasonings are available only to restaurants and foodservice institutions that buy directly from U.S. Foodservice. Ingredients: Salt, Sugar, Paprika (as color), Spices, Dextrose, Chili Pepper, Dehydrated Onion, Turmeric (as color), Natural Flavor, Black Pepper, Red Pepper, Dehydrated Garlic and less than 2% Tricalcium Phosphate to prevent caking. Durkee Zestful Seasoning - Durkee is a division of Tone Brothers, Inc. Tone Brothers Spices was owned by Rykoff-Sexton between the years 1989 and 1994. A Tone's spokesperson said that their Durkee Zestful Seasoning is based on the old Sexton formula. You'll note that the Durkee product and the Monarch product carry identical ingredient labels. I sampled both seasonings side by side and could not discern any difference in taste. Available online from Edge Distributing or by calling 1-800-373-3726 ($12.00 for a 33 oz. container). Ingredients: Salt, Sugar, Paprika (color), Spices, Dextrose, Chili Pepper, Dehydrated Onion, Turmeric (color), Natural Flavor, Black Pepper, Red Pepper, Dehydrated Garlic and Less than 2% Tricalcium Phosphate to prevent caking. McCormick Alamo Zestful® Seasoning - McCormick claims to be the world's largest spice company so it's no surprise that McCormick has an Alamo Zestful Seasoning blend of its own. McCormick developed its Alamo seasoning back in 1999 to fulfill a customer's demand for this type of seasoning (they wouldn't tell me which customer.) With a clean and spicy taste, McCormick Alamo Zestful Seasoning has a flavor that very closely resembles Sartin's current spice blend. Ingredients: Salt, Sugar, Monosodium Glutamate (Flavor Enhancer), Dextrose, Spices (Including Red Pepper), Chili Peppers, Onion, Paprika, Garlic, Turmeric, Extractives of Paprika, and Extractives of Turmeric. Also available with no MSG. Note: The last time I spoke with a McCormick representative, I learned that this seasoning blend was being phased out. Fiesta Bar-B-Que Crab Seasoning - Manufactured by Bolner's Fiesta Products, Inc. located in San Antonio, TX. When supplies of Sexton Alamo Zestful Seasoning dried up, restaurants scrambled to find a similar seasoning for making BBQ crabs. Bolner's reverse engineered a sample of Alamo seasoning and created a seasoning blend that's close to the original Sexton formula (some say it's better!) According to Michael Bolner, their product is used in nearly all of the BBQ crab restaurants in the Golden Triangle (the area around Beaumont, Port Arthur and Orange.) Bolner's calls its product Fiesta brand Bar-B-Que Crab Seasoning (available online - $3.39 for a 14 oz. container). Ingredients: Salt, MSG, Sugar, Spices, Onion, Garlic, Dextrose, Propylene Glycol (preservative), TBHQ, and Citric Acid. RECIPE: Here's a close approximation of Bolner's recipe that I came up with: 10 parts salt, 3 parts sugar, 3 parts paprika, 3 parts garlic powder, 2 parts onion powder, 1 part MSG (optional), 1/4 part black pepper, 1/4 part cayenne pepper. Put ingredients in a jar, cover, and shake to mix thoroughly. TexJoy Seafood Seasoning - Manufactured by the Texas Coffee Company, Beaumont, TX. The Texas Coffee Company is the manufacturer and distributor of Seaport Coffee and a full line of spice blends under the TexJoy label. Try their TexJoy brand Seafood Seasoning (available online - $3.15 for a 16 oz. container). This product tastes more like Old Bay seasoning than Alamo seasoning, but nevertheless makes good BBQ crabs. Ingredients: Salt, Cayenne Pepper, Garlic Powder, Spices, and Calcium Stearate. McCormick Old Bay Seasoning - In a pinch, you can use Old Bay brand seasoning (available nationwide) to prepare BBQ crabs. Mix equal parts of Old Bay and sugar to get a close approximation of Zestful Seasoning. Ingredients: Celery Salt (Salt, Celery Seed), Spices (Including Mustard, Red Pepper, Bay [Laurel] Leaves, Cloves, Allspice [Pimento], Ginger, Mace, Cardamom, Cinnamon), and Paprika. 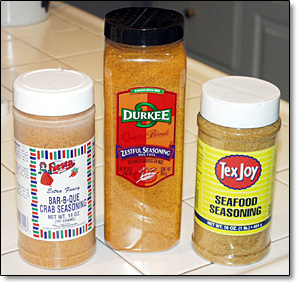 Homemade seasoning - If you wish to try your hand at making your own seafood seasoning, try any of these recipes. For truly authentic tasting BBQ crabs, I highly recommend using Fiesta brand Bar-B-Que Crab Seasoning by Bolner's Fiesta Products. Bolner's product is virtually indistinguishable from Sartin's formula. I also recommend the Monarch Alamo Zestful Seasoning and Durkee Zestful Seasoning (actually, the Monarch and Durkee products taste exactly the same!) I've been told that the Monarch/Durkee seasoning tastes nearly identical to the original Sexton product (I was told this by people who can still remember what the Sexton seasoning tasted like.) But, these same people actually prefer the taste of the Fiesta seasoning.